Malasaña, one of Madrid's most creative neighbourhoods, is known for its many charming independent boutiques and theatres. 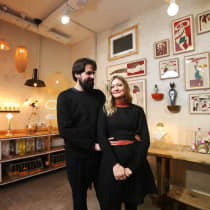 Here is where you'll find El Moderno, a beautiful homewares and gifts boutique founded by David and Delphine. With its shelves stacked with curios from the pair's travels around the world, it's the perfect place to while away the hours looking for your next unique find. "We love it when we can help our customers find the perfect product for themselves or their friends. It makes us feel like we've helped them discover something really special."